Please refer to our stock # FIG68 when inquiring. 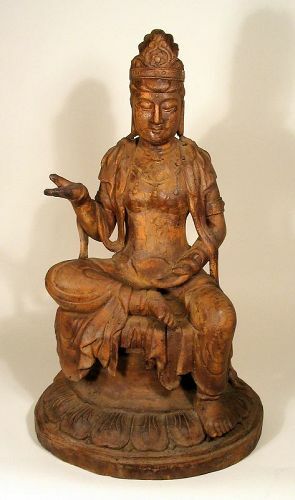 DESCRIPTION: A large, carved wood figure of the Chinese deity Guanyin (also Quanyin, or Kwan-yin), seated on a throne with right leg folded and right hand extended in the abhaya mudra position, a gesture of reassurance, blessing and protection (or “do not fear”). Her hair is worn pulled up in a chignon inside her crown, and around her shoulders is draped a short shawl with flowing ribbons. In good, solid condition with minor age wear; early 20th C. DIMENSIONS: 24 ½” high (62 cm) x 14” wide at the base (35.5 cm). CULTURAL BACKGROUND: Guanyin is the Chinese deity of compassion and mercy. She is one of the most favored and well known of the Bodhisattvas, enlightened beings who have delayed entering paradise in order to help others attain enlightenment. In the Chinese language, "Guanyin" means "observing the sounds," meaning Guanyin hears all the sounds from the world and listens to the prayers from her worshippers. This goddess comforts the troubled, the sick, the lost, and grants sons to the infertile.